“Pegida very clearly belongs” to Germany, said Vice Chancellor Sigmar Gabriel, warning against marginalising followers of the anti-Islam movement, and asserting citizens’ democratic right to be politically reactionary. EURACTIV Germany reports. In the debate over how to deal with Germany’s anti-Islam movement, Pegida, Vice Chancellor and Social Democratic Party (SPD) leader Sigmar Gabriel warned against marginalising the organisation’s followers. In doing so, Gabriel implicitly criticised all those who called for a clear dissociation with the anti-Islam movement, over the past few months. The SPD leader said he agrees with the argument “that refusal to talk, the collective bashing, only riled up the protests and increased their size”. 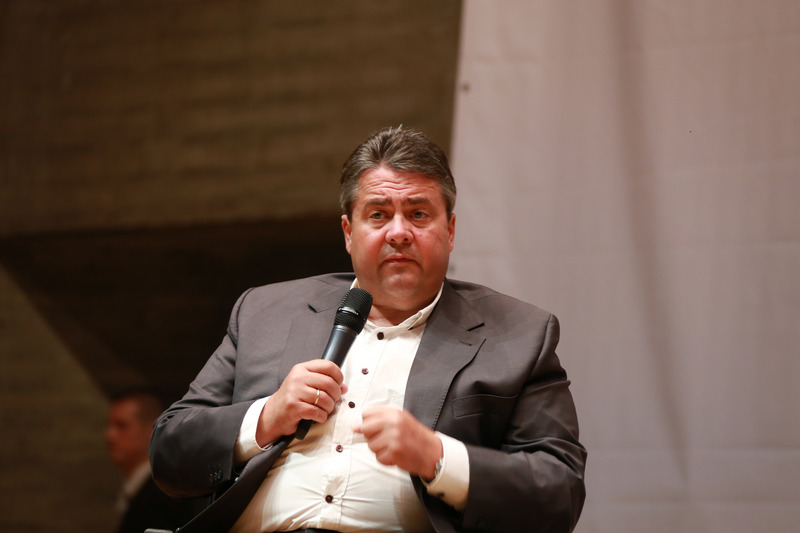 Two weeks ago, the Social Democrat made an unexpected appearance at a discussion event in Dresden, which was attended by both followers and opponents of the Pegida movement. Meanwhile Green Party MP, Volker Beck, referred to Gabriel’s comments as having “richly gone wrong”. “Of course right-wingers or German nationalists have a right to broadcast any nonsense in the world, as long as they do not express sedition or offences,” said Beck, speaking to EURACTIV Germany. But resentments must be taken seriously as a problem, instead of creating misunderstandings as Gabriel is, Beck contended. “Whoever is stirring up hatred against minorities, cannot expect us to pat him on the back,” the Green politician commented. Beck was supported by his fellow party member Özcan Mutlu. “Hopefully the X-Gida crowds will be completely gone soon. @sigmargabriel should understand that…” Mutlu tweeted, referring to the numerous anti-Pegida demonstrations all across Germany. Within Gabriel’s own party, there is reluctant acceptance of the leader’s behaviour. Two weeks ago, Secretary-General Yasmin Fahimi said she “did not want to start any dialogue with people, who stir up sentiment against migrants, against foreigners and against dissenters”, But now she seems to be moving in the opposite direction. She advocated “setting the hairsplitting aside, over who is allowed to speak to whom or not.” There is no ban on talking and especially not on listening in the SPD. In this way, the SPD is moving closer to the anti-Islam organisation, despite the heated debate within the party and elsewhere over the correct approach to Pegida. As for Gabriel, the Vice Chancellor once again defended his visit in Dresden as the right decision. “Completely normal Dresdeners were there with their everyday concerns. Should we leave them to right-wing radical and populist backers from Pegida?”, he said. The SPD is taking a similar approach to the Saxonian state government, which has organised events with the city of Dresden to provide a platform for dialogue between citizens and leading regional politicians like State Prime Minister Stanislaw Tillich (CDU). Issues like asylum, integration and immigration top the agenda in these discussions. But Pegida’s followers are far from being normal citizens, according to a recently published study by political scientist Werner Patzelt. He finds that around one-third of Pegida followers are right-wing nationalist xenophobes. Accordingly, reactions from Saxony’s Prime Minister Stanislaw Tillich were alarmed. Not long ago, he contradicted Chancellor Angela Merkel’s comment that Islam is a part of Germany. Tillich, who also hails from Merkel’s Christian Democratic Union (CDU), said he does not share her view. Muslims are welcome in Germany, he said, and can practice their religion. “But that does not mean Islam is a part of Germany,” the Saxonian leader contended. But such positions remind critics of France’s right-wing populists in the Front National party, which touts xenophobia and does not want to allow any more immigrants into the country. With demands for control through marginalisation and monitoring borders, the party chairman Marine Le Pen won 25% of the vote in the 2014 European Elections. But at first glance, the conditions in Germany seem to be different. Certain signs indicate that the Pegida movement will dissolve soon. After the resignation of Pegida leader and co-founder Lutz Bachmann and spokeswoman Kathrin Oertel, as well as half of its leadership a few days ago, the remaining Pegida leaders are disunited and the number of followers is slowly diminishing. At the same time, Beck warns this is not reassuring. “Every movement that only expresses resentment, will run out of steam at some point,” he said. But even if Pegida disappears soon, the resentment problem is not gone, Beck emphasised. The movement has shown that in this day and age, matters of course like immigration, religion and press freedom must apparently be defended again, Beck pointed out. The vague anger of Pegida followers has dangerous potential, which is also illustrated by movement to the right-wing populist and Eurosceptic party Alternative for Germany (AfD), he said. “The AfD is a vacuum for dangerous tendencies – from everyday right-wingers to right-wing extremists,” Beck explained. These tendencies must be countered, he said, with arguments from politics, discussions, forums and demonstrations.